I came into breakfast this morning to overhear a conversation about the switch. I assumed someone’s cabin hot water heater had fused. It became clear that the discussion was about Nature's river switch that sometimes confounds us salmon fishers. 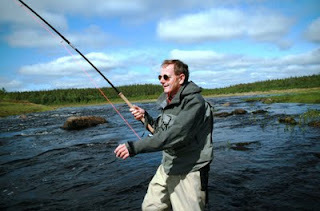 ﻿After four days of really good fishing weather our fifth day was extraordinary bright with a strongish up-stream wind. 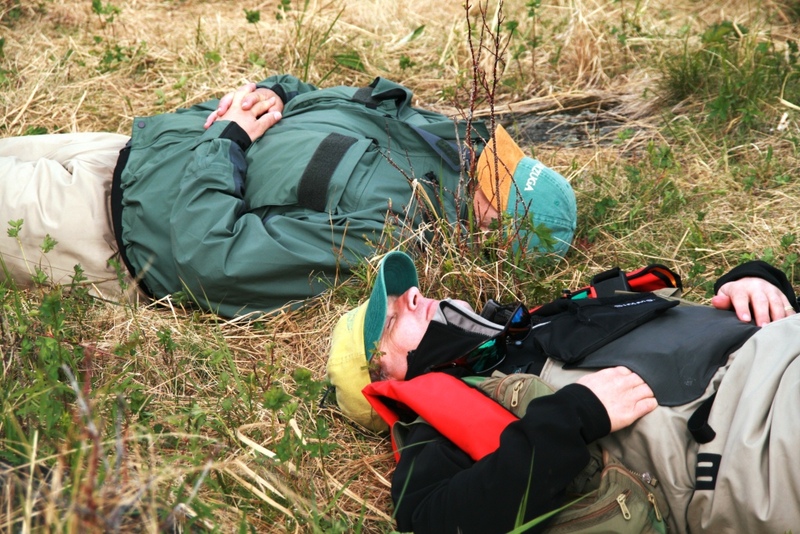 It never really felt fishy, the water temperature climbed back to 15⁰C, everyone had to work hard for reward. In other words, it was not a day our guests went down to the boats with a skip in their step. 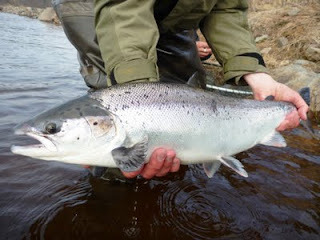 Simon G again managed to work it out and had 6 salmon from the fast water at Korevi Pots on the single handed rod. Sadly his success was not reflected across the board and we finished the day on 31. By no means a bad score but given the number of fish here it was decided that Nature had thrown the switch on us. I have not heard Kitza’s final score from yesterday, rumour has it that it was around 20, taking them over 100 for the week so far. Like us, Pana had a patchy day landing 40 salmon of which 12 came off the ever popular float trip. Dan B had another excellent day with 12 good fish landed. Conditions improved last night as the cloud cover returned, Laurence L had four from Generator and another two this morning before breakfast, all on his 13 foot split cane rod. A softer morning today, with some cloud cover – looks much better (I hope I have not spoken too soon!). A warm day yesterday but not too bright giving us pretty good fishing conditions over the whole river. 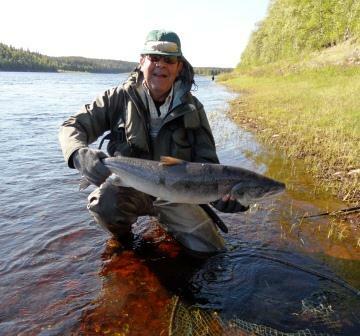 Our regular team of eight guests at Pana did not land quite as many as previous days with 49 salmon banked. Although numbers were slightly down they had two super fish, one of 25lbs to Ashton C and an 18lber to David L.
The Kitza party had over 20 fish, I do not have the full score yet, but I heard that Brian P was leading the way with 7 salmon by early afternoon. In the evening they all went down to the mouth of the river on the White Sea for a BBQ. 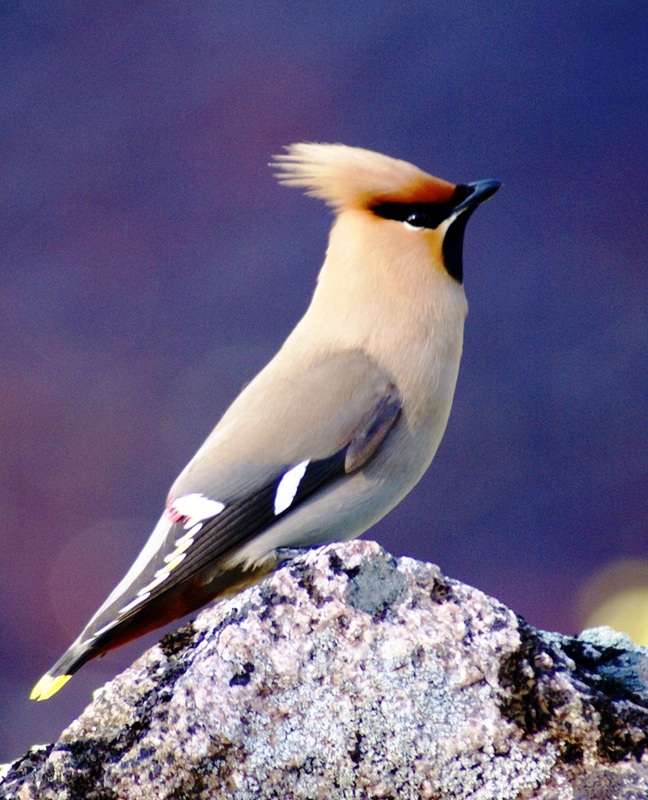 This expedition is always enjoyed, the White Sea light is extraordinary in the evenings and the coast is teeming with wild life and birds. Often we see whales in the estuary. The fishing at Middle camp is proving remarkably consistent with 58 salmon landed, all fairly evenly spread amongst the rods other than Laurence L who made the most of the faster water at Pashas Rest and banked 15. We saw more pods of fresh grilse splashing through yesterday – they fight like mad, jumping spectacularly. 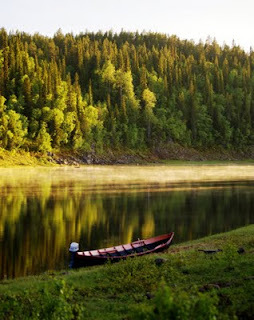 ﻿﻿The water temperature is a perfect 12⁰C and at Middle Camp the level continues to drop about 2.5 cm per day. Very much floating line conditions and small flies in the range 8 – 12. Experimentation continues. 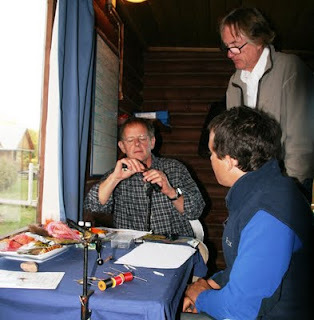 Yesterday evening Paddy F produced a good looking fly tied by a Spey ghillie and it was decided to copy it. However, missing from our fly tying kit was any suitable white hair. 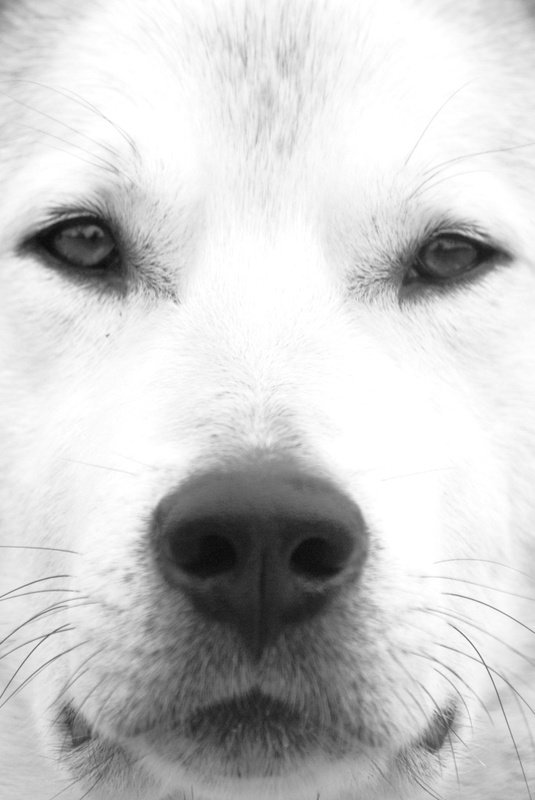 The only possible source was soon narrowed down to Mouchar (ch like lough), our large camp dog whose role is to keep bears off this island camp. Mouchar means fly in Russian so it all seemed to be coming together nicely. Mouchar lives outside most of the year and his thick, back hair proved to be poor fly tying material. After some debate we recalled from where, on a rams anatomy, the body dubbing for the famous trout fly The Tups Indispensible comes from. Now - those of you who know where on a ram the dubbing for a Tups originally came from will grasp immediately the delicate and possibly dangerous nature of the task ahead. Fortuitously we were able to pour sufficient vodka into Hugh, our camp manager, that he risked life and limb to acquire the necessary hair. So a new fly was born and taken on its first outing by Frans van S who landed one and lost three on it. It has yet to be officially named although several suggestions have been made, the only one I dare mention on this blog is the Mutts Nuts. I digress - on the fishing front, the Kitza party have landed 64 salmon so far this week with the better fishing on the higher beats. 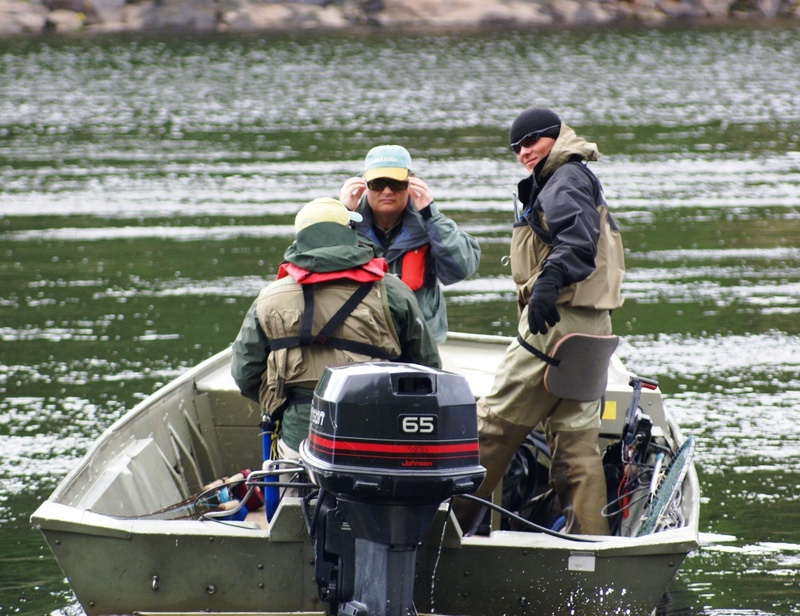 Low water is now beginning to limit their fishing to the more accessible pools. Pana continues to be excellent, yesterday Charlie T had 17 fish out of a total of 74. Here at Middle Varzuga we had 56 for the day with Simon G again getting a 14lber on a single handed rod and tiny skated fly. Party Pool was full of fresh fish yesterday - very encouraging. A cold morning yesterday, but by lunch time the weather improved and we had another glorious afternoon of mixed sun and cloud. 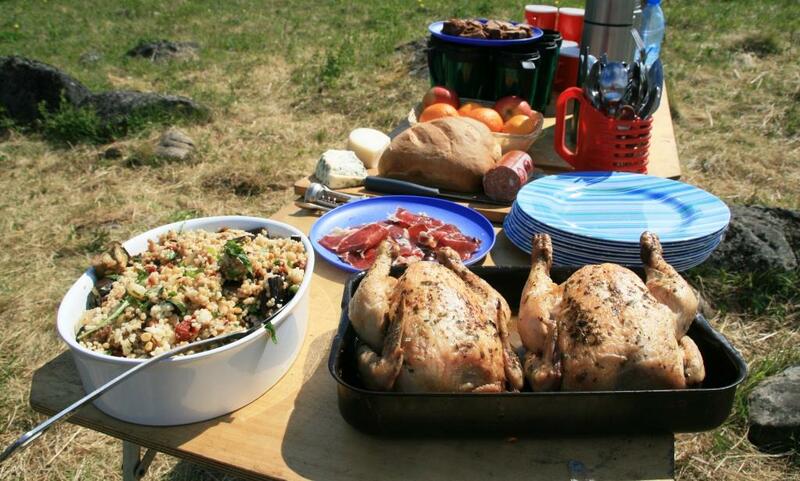 At Middle Camp Jemima produced a ‘little light luncheon’ on the river bank; the combination of roast chicken and warm sunshine led to the inevitable siesta before battle was re-commenced later in the afternoon. 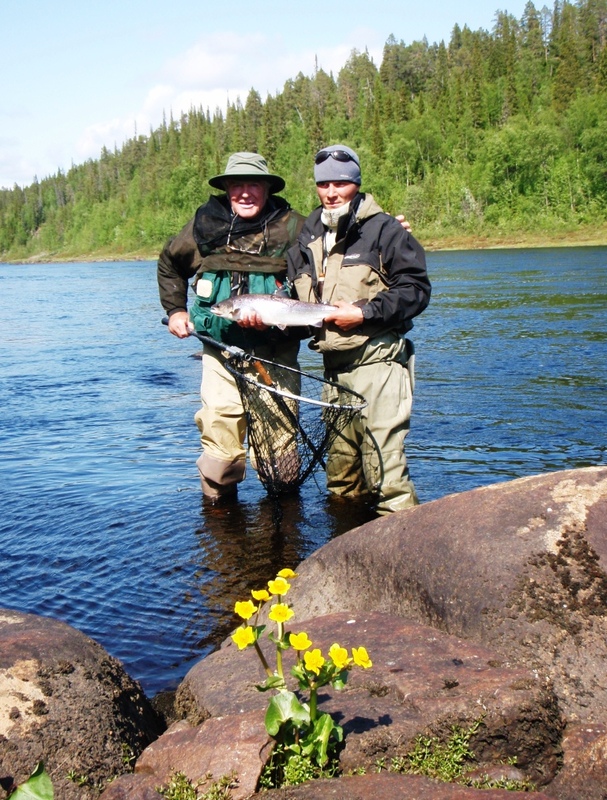 Frans van S landed his first Atlantic salmon from Bear and then proved this was not just luck by quickly landing another and losing two in Generator. It is always a relief to have everyone on the score board, and with plenty of fish here experimentation has started in earnest. Laurence L had a couple of fish on his 13 ½ foot Hardy split cane rod and a 1922 Perfect reel. The reel makes a wonderfully iconic sound as the fish take line; “The church bells are ringing” a guide in Norway once said to me. After catching a fish of 13lbs in Simmons yesterday Simon G has borrowed my 10 foot Sage and a box of small skating flies to see what he can tempt to the surface. Jamie the camp manager at Pana reported 71 fish yesterday, the lower beats providing the best fishing and the boats are still able to get through to Ponzoi . At Middle we landed 50 fish for the day, with more caught after dinner and not yet in the book. The water temperature has dropped back to 12⁰C, just perfect for the Varzuga. We had perfect Varzuga fishing conditions yesterday morning, mixed sunshine and showers and a soft down-stream breeze to flatter the casting skills (not that this team at Middle Camp need much help – most having ‘fished a bit’!). The afternoon was more tricky, quite cold, the wind picked up and the salmon put their heads down. ﻿ Pana continues to fish wonderfully and the eight rods landed 105 salmon; Dan B was top rod with a fabulous day of 29 fish. 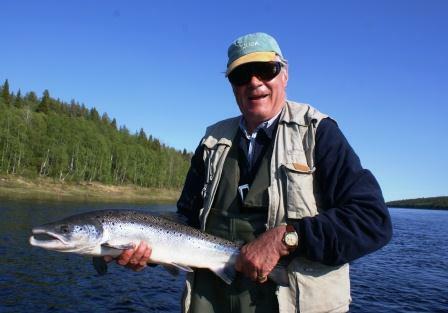 Kitza reported a biggish run of grilse coming through the lower beats and they had 29 fish for the team of seven. Here at Middle Camp our 11 guests landed 70 salmon. Birthday and Party Pools are just beginning to slow down and now we are sending two boats right up to the top beats at the head of Yovas rapids – possibly the most beautiful place on the river. After a busy Saturday I had a chance yesterday to catch up on some administration, and to reflect on last week’s fishing. Despite the very hot, bright weather Kitza and Pana had excellent weeks, both hovering around the consistent long term average of 30 salmon per rod/week. Middle Camp was slightly ahead with just under 40 salmon per rod. Very creditable results given the conditions. 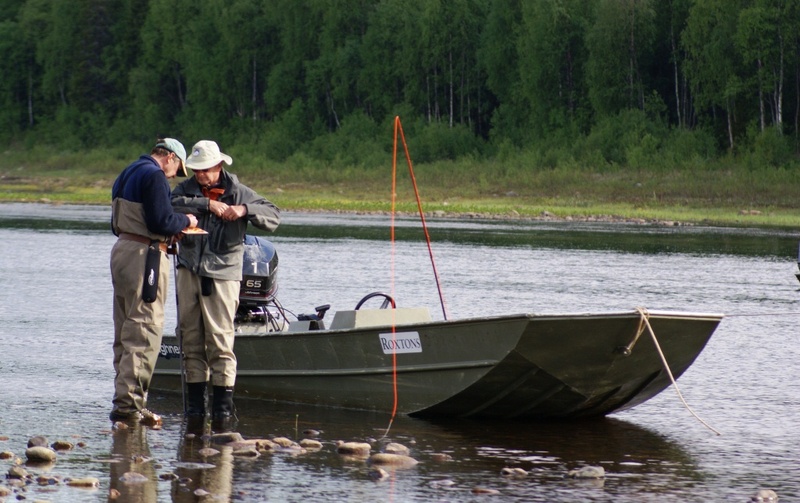 All of us involved in the river feel the run of fish this year is stronger than 2010 and there seems no shortage of fresh, silver fish still running in from the White Sea. I’m going out guiding today – needing practice after being soundly beaten by young Jesse last week. A public apology to Paul Young and Colin S for our boating adventure on the rocks on Thursday. The guides here at Middle Camp are amused at my new title of ‘Captain Nemo’! P.S. Cooler this morning. 4⁰C at breakfast so it might be a slightly tougher day. Saturdays up here bring a degree of urgency and, dare I say it, controlled chaos at Murmansk airport; it is always a relief to get everyone on to the helicopters and on the way to the camps. We were all settled in by late afternoon and within minutes rods were being put up in eager anticipation of a week on the Varzuga. 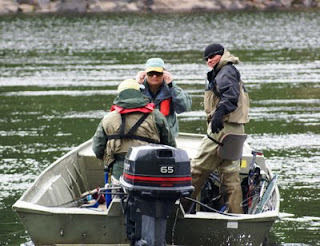 We are now concentrating our fishing efforts from the Pana, Kitza and Middle Camps and I have based myself at the later. All camps had landed fish before dinner last night, here at Middle the team landed 20, Simon G leading the way with 7 salmon from Generator. We had some rain in the evening and thankfully the baking hot sun of last week has been replaced with much cooler, cloudy weather giving us excellent fishing conditions. The water temperature had reached 16⁰C on Thursday, hopefully it will now drop back towards an optimum 12⁰C. Floating lines remain the most popular, flies are the usual eclectic range the top choice probably being a size 8 Cascade. This morning has started well with Laurence L putting 4 bright silver salmon into the record book before having breakfast (wearing a very happy smile! ).